Hailu A, D. Economic evaluation of malaria prevention in Ethiopia: Economic burden, equity, and cost-effectiveness analysis of malaria prevention in south-central Ethiopia [PhD]. Bergen: University of Bergen; 2018. Background: Despite remarkable efforts in the global fight against malaria and achievements in the reduction of morbidity and mortality in the last decade, the disease remains to be a huge challenge to the health systems of malaria-endemic low-income countries in Africa and in all corners of the globe. Beyond the wide range of consensus on the disease burden and prioritization of malaria, the available evidence on the economic burden of malaria in Ethiopia is scanty. No clear evidence yet exists about the additional resources required for a combined implementation of long-lasting insecticidal nets (LLINs) and indoor residual spraying (IRS) with respect to the added protection afforded. In addition, little is known about the prevailing status of LLINs and IRS across different levels of wealth strata. Objectives: The aims of this thesis were to estimate the economic burden of malaria; to evaluate the cost-effectiveness of a combined implementation malaria prevention interventions (LLINs and IRS); and analyse the distributional (equity) implications of the interventions in the Adami Tullu district, south-central Ethiopia. Methods: Studies included in this thesis were conducted from 2014 – 2016 in the Adami Tullu district of Oromia Region, in south-central Ethiopia as part of and partly in conjunction with the MalTrials project. We conducted a cost of illness using 190 malaria patients in the first study. In Paper II, we carried out a combination of trial-based and literature-based cost-effectiveness analysis using Markov modelling. In the third study, using a cross-sectional data from 6069 households we did an inequality analysis of ownership of LLINs and IRS status. The principal component analysis technique was used for ranking households based on socioeconomic position. We measured the inequality in LLINs and IRS using concentration indices and concentration curve (Paper I&III). Results: The median cost of malaria per episode to the household was USD 5.06 (IQR: 2.98 – 8.10) and the direct cost was significantly higher among the poor. The trial-based analysis had shown that the routine practice dominates both the combined intervention and singleton intervention while the literature-based analysis had indicated that combined intervention had an Incremental Cost-Effectiveness Ratio of USD 1403 per DALY averted. Immediately before we started the trial, the LLIN ownership was 11.6% and IRS coverage was 72.5%. We found a concentration index of 0.0627 for LLINs and – 0.0383 for the IRS. Inequality in LLIN ownership was mainly associated with a variability in a housing situation, the size of the household, and access to mass media and telecommunication service. Conclusions: The economic burden of malaria to the rural households in Ethiopia is huge—mainly to the poor. Based on the trial-based cost-effectiveness analysis, we conclude that the combination of LLINs and IRS is not likely to be a cost-effective option compared with singleton intervention. However, based on the literature-based analysis, the combined intervention had potential to be a cost-effective alternative at 3 times GDP per capita per DALY averted. Furthermore, the ownership of LLIN was very low and significantly pro-rich, while IRS status was equitable across socioeconomic strata. Some years ago we did two trials [1 2] to improve case finding of tuberculosis in South Ethiopia. Our study from Sidama in South Ethiopia showed that involving Health Extension workers in Tuberculosis control improved the case detection (from 69 to 122 %) for smear-positive patients and females in particular . We advised that this intervention could be used as an option to improve case detection and provide patient-centred services in high-burden countries. In a later study, we showed that this intervention is a cost-effective treatment alternative to the health service and to the patients and their caregivers . We advised there is both an economic and public health reason to consider involving HEWs in TB treatment in Ethiopia. Now a large consortium (Stop TB Partnership’s TB REACH initiative and implemented by the Southern Region Health Bureau and the Liverpool school of Tropical Medicine in collaboration with the Ministry of Health and the Global Fund) has scaled up this intervention in Sidama . Their findings are similar to our earlier research: “Community-based interventions made TB diagnostic and treatment services more accessible to the poor, women, elderly and children, doubling the notification rate (from 64 to 127%) and improving treatment result. They advise that this approach could improve TB diagnosis and treatment in other high burden settings”. I hope that they also present some findings on how this good intervention can be made sustainable in settings such as Sidama. 1. Datiko DG, Lindtjørn B. Health extension workers improve tuberculosis case detection and treatment success in southern Ethiopia: a community randomized trial. PLoS One 2009;4(5):e5443 doi: 10.1371/journal.pone.0005443[published Online First: Epub Date]|. 3. Datiko DG, Lindtjorn B. Cost and cost-effectiveness of smear-positive tuberculosis treatment by Health Extension Workers in Southern Ethiopia: a community randomized trial. PLoS One 2010;5(2):e9158 doi: 10.1371/journal.pone.0009158[published Online First: Epub Date]|. 4. Yassin MA, Datiko DG, Tulloch O, et al. Innovative Community-Based Approaches Doubled Tuberculosis Case Notification and Improve Treatment Outcome in Southern Ethiopia. PLoS ONE 2013;8(5):e63174 doi: 10.1371/journal.pone.0063174[published Online First: Epub Date]|. Ethiopia, with over 80 million people, is heavily affected by tuberculosis, complicated by poverty and HIV infection, limited access to the health service and shortage of health workers. We recently reviewed tuberculosis control programme in South Ethiopia. Although treatment success rates have improved during the last decade, low case notification rate, mainly because of inability to access the health service, remains a challenge. Using community health workers, we enrolled health extension workers (HEWs) in providing health education, sputum collection and providing treatment. This improved case detection, and more significantly for women, because the community-based sputum collection increased access to the diagnostic services. Similarly, community-based treatment improved the treatment success of smear-positive patients (90%) compared with to health facility-based treatment (83%). This approach also reduced the total costs by 63%. Thus, such interventions are economically attractive to the health service and patients, caregivers and the community. Community based intervention improve access for the poor and for women to have better access to the health service. It is effective and an economically attractive alternative to the traditional health services. By improving health service delivery to the affected community living in high burden countries, this is an example of how operational research in developing countries provide evidence for policy change. Recently, this approach was endorsed by the Ministry of Health Ethiopia. Health Extension Workers shall now be involved in tuberculosis control in Ethiopia. This research has been carried out by Daniel Gemechu Datiko. This week he defends his PhD at the University of Bergen. You can read his thesis at: Improving Tuberculosis Control in Ethiopia: Performance of TB control programme, community DOTS and its cost-effectiveness. Even if 36 million patients with tuberculosis were successfully treated, and up to 6 million lives were saved during the past 15 years, tuberculosis remains a major public health problem. More than 9 million cases occur every year. Unfortunately, only a little more that half of the expected cases are identified yearly and receive proper care. We therefore need novel measures to diagnose, treat, and thus stop transmission of tuberculosis. Many have previously questioned the role of active case finding in reducing tuberculosis prevalence. Recently, several active case-finding strategies for tuberculosis were tested and proved to be effective, both in urban (Corbett, Bandason et al. 2010) and rural settings (Datiko and Lindtjørn 2009). The Lancet study (Corbett, Bandason et al. 2010) also documented the effect on the prevalence of culture-positive tuberculosis. The study from Ethiopia also showed that active case finding is a cost-effective strategy (Datiko and Lindtjørn 2010). These studies highlight active case-finding in tuberculosis control efforts, especially in settings where HIV is prevalent and in weak health systems. Evaluate tools for effective active case-finding so it reduces tuberculosis prevalence. To do this we should also set up good records on tuberculosis prevalence, and thus be able to document a future decline in tuberculosis prevalence. We need to develop different models for active case finding in communities. By this, I mean practical tools on how to do this in a local community. We are starting a new research in Ethiopia to develop “tuberculosis suspect registries” in the communities as a tool to identify patients with tuberculosis. In addition, we urgently need fast, accurate, and simple diagnostic test. And, scaling up active case-finding outside health institutions needs to be paired with increased scientific interest, research investment, and political commitment for high-quality basic and operational research. Datiko DG, Lindtjorn B (2009) Health extension workers improve tuberculosis case detection and treatment success in southern Ethiopia: a community randomized trial. PLoS One 4: e5443. Datiko DG, Lindtjorn B (2010) Cost and cost-effectiveness of smear-positive tuberculosis treatment by Health Extension Workers in Southern Ethiopia: a community randomized trial. PLoS One 5: e9158. The Prime Minister of Norway, Jens Stoltenberg and the Gordon Brown, former PM of Great Britain, underline that governments of poorer nations have to put resources into education and health, and not into corruption. As I have outlined previously, corruption is widespread at health institutions. Fighting corruption is necessary because corruption reduces the resources available for health. Corruption also lowers the quality, equity and effectiveness of health care services, and it decreases the volume and increases the cost of provided services. Corruption also discourages people to use and pay for health services. It is encouraging that world leaders talk about broadening the tax base, and identify fighting corruption as a means of achieving the MDGs. The leading donors should encourage governments to put in place mechanisms at each institution to reduce corruption. This should include such basic functions and proper accounting systems and mechanisms for independent financial audits. Do NGOs corrupt health institutions? Many international organizations and Non-Governmental Organizations (NGOs) support health work in developing countries. Often, their work is to train staff to get necessary skills, and thus improve health services. Each NGO have their specific goals, and wish these tasks to be carried out at institution. Good examples that have helped many patients include HIV work, reproductive health, and support to specialists to carry out operations at rural institutions. Although the NGOs do this with the best of intentions, their support is often misused, and unfortunately weakens institutional sustainability and equity. A NGO supports that patients with diseases such cleft lips are operated at district hospitals. The organizations provide the local staff with good training to carry out such treatment. Many patients receive good treatment. Unfortunately, we often note after the early campaigns, operations are not done between campaigns as planned. The NGO pays extra for each operation to the staff during campaigns, but not for operations done between campaigns. This often leads to staff only operating when they receive extra payment. This is an example of “misuse of entrusted power for private gain” (Transparency international definition of corruption). UN organizations and NGOs often organize training seminars and workshops. The participants might receive daily allowances up to half of their monthly salaries. Unfortunately, some participants are not even qualified to carry out the intended work. We know of examples when managers, without medical training, took part in course on how to treat drug resistant tuberculosis. And some staff take part in courses to resuscitate neonates, but never work in a delivery ward. Again, examples of “misuse of entrusted power for private gain”. I believe it is time for NGOs and International organizations to look into the side effects of their massive support to health institutions. A proper question is: Are there alternative ways to support institutions with much needed training, and at the same time not tempting the institutions and individuals to take part in corruption? Most international organizations and NGOs have increased sustainability and equity as part of their visions. If sustainability and equity is a goal for such organization, new ways to support the institutions should be sought. Corruption depletes resources from the health institutions such as hospitals and health centres. For example, countries with a high corruption index have higher child mortality rates. How can health institutions reduce corruption, and increase available resources for patient treatment? In a good review article, Taryn Vian (2007) defines what corruption at health institutions is, explains why it reduces necessary and scarce resources, and how corruption can be reduced. Vian outlines the mechanisms on how managers rationalize social norms, moral or ethical beliefs, attitudes and personalities to their own benefit. Weak accountability, lack of citizen voice and transparency turn out to be opportunities for abuse. And, poor wages and pressures from clients become pressures for misuse. Unfortunately, many health institutions have weak management, inadequate accounting, and there are few lawyers to follow up financial misuse at health institutions. However, much can be done to reduce corruption. In our work in Ethiopia we try to focus on the following points as part of a ways to ensure sustainable health institutions. Each institution must simplify the cash collection procedures, and internal auditors must daily check the cash collection. Each institution needs yearly financial audits. As health institutions collect patient fees, institutions are accountable to the public. Therefore both public and certified auditing institutions should audit the finances of health institutions. During the past years we have seen hospitals worsen because of changes of staff and a lack of control mechanisms. External support to health institutions in many developing countries should be accompanied with a need for sound management, accounting and auditing practices. Corruption at health institution is a concern in all countries, but it is especially in developing countries where public resources are already scarce. Countries with high indices of corruption have for example higher rates of infant mortality. A recent World Bank report from Ethiopia (Lindelow and Serneels 2006) report on “pilfering drugs and materials, informal health care provision and illicit charging, and corruption” at health institutions in Ethiopia. The authors focus on “weak accountability mechanisms and the erosion of professional norms in the health sector” as a main causes of corruption. Fighting corruption is important because corruption reduces the resources available for health. Corruption also lowers the quality, equity and effectiveness of health care services, and it decreases the volume and increases the cost of provided services. Corruption also discourages people to use and pay for health services. Preventing abuse and reducing corruption is important to increase resources available for health, and thus to improve the health status of the population. In our health work in Ethiopia we only work with institutions that focus of transparent management procedures, and have proper accounting and perform regular external financial audit. In our experience it is also important that public auditing institutions (“Office of general audit”) regularly evaluate health institutions. There are unfortunately many hospitals in Ethiopia and in Africa that do not work as expected. They lack staff, or equipment. Often they lack staff doing essential interventions such as caesarean sections. 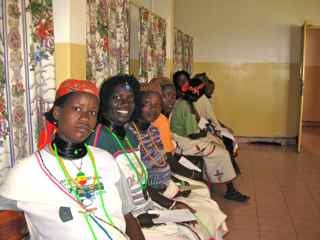 Gidole Hospital is a district hospital in south-west Ethiopia. It was a busy mission hospital. When the expatriate staff left, the hospital more or less collapsed. There were fewer patients, and patients had to be transported to a referral hospital for emergency surgery. Now the hospital works as a rural hospital again. Two dedicated health officers do essential obstetrics, including caesarean sections. They also do essential surgery such as management of fractures, and treatment of severe wounds. These improvements have also brought about other changes: more patients with other diseases use the hospital and patient revenues has increased. The hygienic standard at the hospital is acceptable. The floors are often washed, and the patients receive clean bedclothes. In addition, the hospital should be able to make enough income to sustain work and keep staff. Gidole Hospital does not have a doctor now. It works adequately with non-clinician physicians.